There's no rule that says spring cleaning has to last only one spring. Cheryl and Danny Hansford spent a full 18 months spiffing up the 1960s architecture of their longtime home overlook a golf course in Pleasanton, California--and swept away a lifetime of tchotchkes, oversized furniture, and outdated accessories in the process. That kind of dramatic change would terrify many people, but the Hansfords fearlessly embraced their big purge and in return got the home of their dreams. Rethinking your life with such confidence takes encouragement. Luckily, Cheryl and husband Danny, a steel company executive and avid golfer, got that in spades when they hired interior designer Kelie Grosso. For two years, the couple had been staring at blueprints for a makeover of the one-story ranch they'd purchased in 1999. But until their daughter Anne Marie introduced them to Grosso, owner of Seattle's Maison Luxe, they hadn't been able to pull the trigger. "We knew we needed more room for our two married daughters and four grandchildren," says Cheryl, a confessed serial entertainer, "and I really wanted a bigger party space!" But Grosso says Cheryl still "needed a little push." First, the Hansfords tore off an old porch that Cheryl recalls as "dark, dark, dark," which also blocked light into the house. In its place they added 500 sun-drenched square feet of space encompassing a new breakfast room and a much-expanded great room, with unobstructed views of Danny's beloved golf course. The next major task was cleaning up the seemingly random French country feel of the place. For instance, the old family room had a cavernous cathedral ceiling, 16 feet at its peak, but the adjacent open kitchen's ceiling was only 8 feet high. Splitting the difference, they took the expansive new great room's ceiling down and brought the kitchen's up to meet it. "It's amazing. Even though it's a much larger space, it feels cozier than before," says Cheryl. Indeed, on a cool Northern California evening, the great room, with it fireplace radiating warmth throughout, is clearly the new soul of the home. Original cabinets were given new doors, while a Viking stove and hood replaced outdated appliances. Calcutta Tia marble sheathes the backsplash and counters. An antique display cabinet from France holds treasured serving pieces. The whole place went through that kind of recalibration and repurposing. "What's now the office used to be the dining room," says Cheryl, adding that the dining room now occupies the window side of the great room, just steps from French doors to the terrace. "Before, we'd have to cram the whole family in the old dining room, and it didn't even have a window," says Cheryl. "It was just a closed-in hovel! Kelie made it into an office and suggested adding a window with a view of the valley. It's perfect." Perfect now, but when Grosso first saw the drawings for the house's radical new plan, she knew the Hansfords' furnishings were a match for the "before" house, no the "after." "I said to myself, Oh, no; so many of her things have got to go. But luckily, Cheryl was ready to do it!" The pair walked around the house with a roll of blue tape, tagging anything tired or dated, and shipped it all off to auction or donated it to a charity. "The house's content are probably 80 percent new," admits Grosso, "and it was a tough transition for the Hansfords because they had all these collections. So I said, 'We'll put some of it in storage and get back to it later,' but Cheryl said, 'No, let's be honest; we're never going back.'" Cheryl can laugh about it now. "I realized that even though I loved my things, I was living in a 'grandma' house. 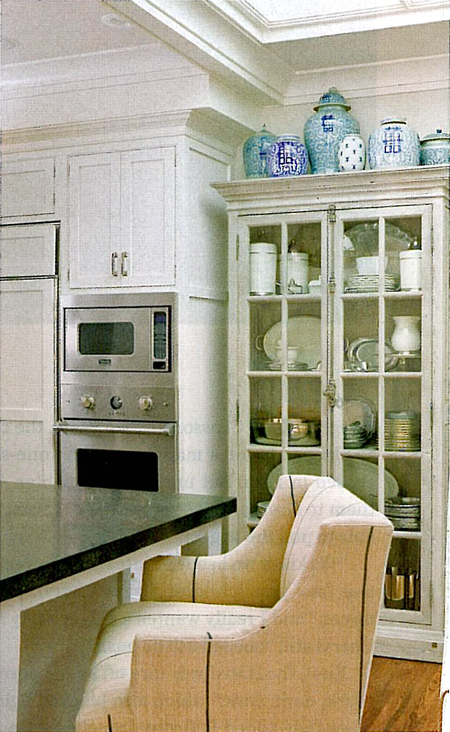 I even got ride of the plaster hood over the stove that I though was so chic back in the day--suddenly it seemed huge and ugly! now I'm all about things that are clean and simple." And what could be simpler than a life lived in just three colors? One way Grosso freshened the style here was by limiting the palette to camel, black, and white, using those colors over and over again throughout the house. "It creates a clear-your-mind kind of house, a fresh, crisp way to live," she explains. While there may be very little color, there is a host of textures to tease the eye--a cowhide rug in the entry, burlap grass-cloth walls in the office, a gloriously worn farm table in the breakfast area, and nubby linen slipcovers in the living room. Pattern also adds interest--like the exotic ikat that upholsters the master bed and the eye-catching zebra-print chair in the great room. The collective impact of the home's three signature colors is serene and supremely livable. "Kelie made this house so much more comfortable," says Cheryl. "I can see now how much easier it is to live in a house with less visual noise and more open space. "I keep saying, 'Why didn't we do this before?' The house just flows into the outdoors." And what is Danny's view of the renovation? "He finally gets to look at the golf course--and Danny always wants to look at the golf course!"